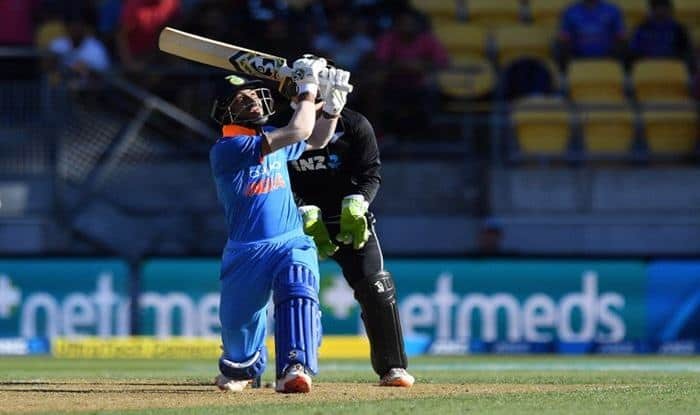 The 25-year-old all-rounder played a spectacular cameo of 45 off just 22 balls that pushed India past 250-mark during fifth and final ODI against New Zealand. Pandya’s belligerent cameo of 45 runs off just 22 deliveries included two boundaries and five huge sixes. It not only enthralled the capacity crowd present at the Westpac stadium but also lifted India’s total to a competitive 252. During his knock, the 25-year old also equalled South African legend AB de Villiers record of smashing a hat-trick of sixes in ODI cricket. This was the fourth time Pandya has hit 3 sixes off 3 balls in ODIs. The only other batsman to do it 4 times in the last two decades is – de Villiers. India made three changes in the playing eleven. A fit-again Mahendra Singh Dhoni was back in the team in place of Dinesh Karthik while Mohammad Shami and Shankar replaced Khaleel Ahmed and Kuldeep Yadav. The chinaman bowler was rested from the game.